Riding Trowel features all-hydraulic powered design. Driven by 74 hp Kubota Turbo Diesel engine, Model HDX 750 features automatic load sensing device, 60 in. diameter 6-bladed rotors for uniform blade and pan coverage, and Generation III joy stick power steering with independent hydraulic blade pitch controls in each joystick. Lights, key switch, tachometer, and 12 V charger are in one location. Additional features include adjustable seats/arm rests, powered spray system for retardant application, and removable steps for blade access. 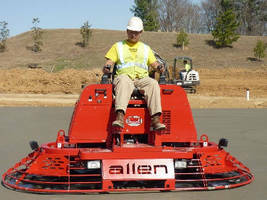 The Allen HDX 750 is a totally new All Hydraulic-Powered Riding Trowel. Packed with the punch of a 74HP Kubota Turbo Diesel, the HDX 750 is one of the most powerful and dependable riders on the market today. The low weight to horsepower ratio and reliable hydraulic components (including a patented automatic load sensing device) ensures a peak "on the concrete" performance every time. The HDX 750 is the newest in the series of Hydra-Drive Extreme (HDX) Allen® Riders. Lights, key switch, tachometer and 12 volt charger all in one convenient location. Allen Engineering Corporation is headquartered in Paragould, Arkansas USA. The company designs, engineers, manufactures, and markets equipment for concrete placing, finishing, and paving professionals with a number one goal of Total Customer Satisfaction. Allen Engineering Corporation is family-owned and their Allen Equipment is American-Made. Allen Equipment is sold through a network of "concrete-focused" dealers and rental centers around the world. For more information, visit the AEC web site at www.alleneng.com. Mechanical-Drive Riding Trowel combines power and ergonomics. Mechanical Drive Riding Trowel operates in tight spots. Entry-Level Riding Trowel offers variable speed operation. Mechanical Drive Riding Trowel facilitates concrete finishing.